Israel is in my Passport, but is it in Me? Just hours after landing in Tel Aviv, all 300 of us were sitting in the fluorescent-lit conference room of a 1970s-era hotel in the Judean Hills, listening to a man named Momo talk about love. "This trip is a gift," said Momo. "All we ask in return is that you fall in love with Israel, you fall in love with a Jew, you marry Jewish, you make Jewish babies, you make aliyah and move to Israel. Is that so much to ask?" I snorted. Was this guy serious? 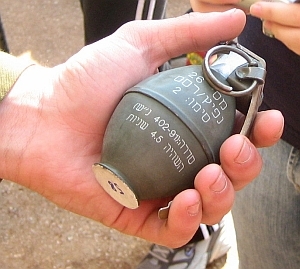 Momo was Shlomo "Momo" Lifshitz, a retired IDF officer and president of Birthright Israel, an organization designed to introduce young American Jews to the homeland. With a bald head, linebacker's build and gruff, Israeli-accented baritone, Momo's had what you might call "stage presence." Much of the audience seemed rapt by his words. Or maybe that was the jetlag. I was 24 years old and visiting Israel for the first time on a free Birthright Israel trip. Though as a travel writer I was used to traveling alone and often by the seat of my pants, I wasn't one to turn down a free trip to a new foreign country, even if it meant traveling on a tour bus with a strict minute-to-minute itinerary. But I wasn't counting on all the love and marriage and move-to-Israel talk. Apparently, I should have known — Birthright Israel is often jokingly referred to as "Birthrate Israel" because so many former trip participants (there are some 250,000 alums) go on to marry and eventually procreate with each other. As a non-religious North Carolina-raised Jew who hadn't seen the inside of a synagogue in years, the very idea of "marry within the tribe" or "Israel-as-homeland" seemed the antithesis of all my liberal multicultural values. In fact, when I left for Israel, I'd recently begun dating an a non-Jewish grad student, a blue-eyed, blond-haired son of the American West whose forbearers had trekked across the country on covered wagons nearly a century before my ancestors fled the shtetls of Galicia. It had only been a few months, but I thought there might be something special there. The day after Momo's speech, I filed into a bus with two dozen or so other twenty-somethings, and set out to see the country. And within a few days, I began to wonder if there was something wrong with me; despite our group leader's strenuous efforts, I wasn't falling in love with Israel. 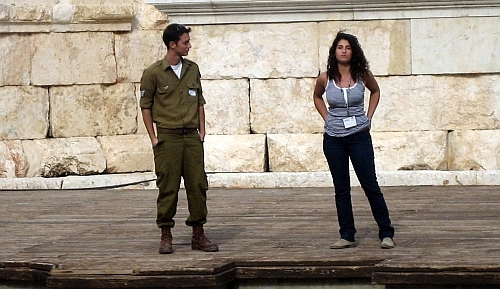 At a kibbutz in the Galilee, I rolled my eyes through a group bonding exercise which involved trying to cross a moat with a rope. In Tel Aviv, I yawned through what was meant to be a rousing lecture on Israeli history and foreign policy. In Eilat, the "Vegas of Israel," I sat bored in the corner of a cheesy bar while Israelis dressed like Gucci models gyrated on the dance floor. In Jerusalem, our tour leader yelled at me for straying from the pack for a minute to buy a disposable camera from a street vendor. Somewhere along a stretch of desert highway, I rolled my eyes as the boy behind me on the bus began to make out noisily with one of the young Israeli soldiers brought along on the trip (both male and female), presumably for this express purpose. 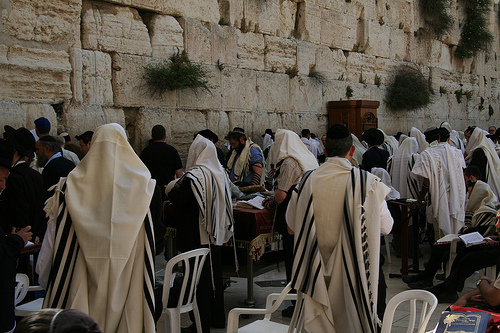 At the Western Wall, the men and women split up to visit their respective sections of the old temple. As we approached, we passed Orthodox women in their long-sleeved t-shirts and head scarves walking backwards in the opposite direction. It's custom to walk backwards when leaving the wall, rather than turn your back to a holy site, someone explained. I reached out and touched the wall. It felt rough and chilly under the cold white December sun. Next to me, a tiny elderly woman in black prayed silently, her chapped lips moving as she rocked back and forth with her eyes closed. Afterwards, a woman from my group asked me if I could "feel it" when I touched the wall. "The power," she said. Some kind of thrilling, voltaic energy lit her eyes from behind. "I could tell that it's a very powerful place for a lot of people," I said, limply. "No," she said, turning those shiny eyes on me. "There was definitely something there. Something that can't be explained." What was my problem? Did I lack a sense of awe? Was I so disconnected from my roots that I couldn't sense the power that has drawn thousands of years of my ancestors to this place? But then something started to happen. I began spending long hours on the bus sitting with Jeff, a Yale medical student, the two of us geeking out over our mutual love of bad 1980s kids movies. I bonded with several of the other women on the trip after we were forced to share a tiny room one night on a kibbutz in the Golan Heights. Our group clown, a computer programmer named Avi, bought Pop Rocks-studded chocolate bars at a grocery store one afternoon and passed out pieces down the aisle of the bus, all of us giggling as the candy exploded in our mouths. Someone gave me a nickname. I've never had a nickname. Suddenly, I felt like part of a group. It was a novel feeling for me — I was always the kid at summer camp hiding in the bunk with a novel while everyone else linked arms and swayed to the camp anthem during Singalong time. It was kind of…nice.